Home ShoppingLuxury Louis Vuitton’s Most Expensive Bags! Louis Vuitton’s Most Expensive Bags! From Paris to Beijing, everyone wants to wear designer wear and accessories; designer bags being one of the most popular accessory. Although, the designer handbags are not always affordable and go out of fashion with the change of seasons, there is a huge craze for them among the fashion conscious. 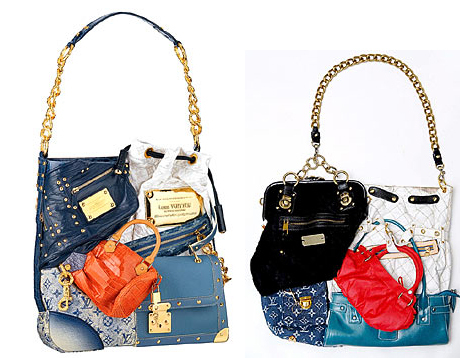 If it is the exquisite cars and shoes that men are obsessed with, it is the expensive designer handbags for the women. With the latest belief being that it is the handbag that makes a woman, these expensive bags are in vogue and aspired for their grandiose and uniqueness. It is the exclusiveness; the high quality of materials used and the status of these handbags that makes women feel all excited and flushed enough to scamper for one of these bags. Little did young Louis Vuitton who first came to Paris in 1837 as an apprentice layetier (luggage packer) realize at that point that he would one day be responsible for high luxury fashion and leather goods. The Louis Vuitton Company that was founded in 1854 has from the beginning always catered to the wealthiest clientele. As the name suggests, the bag was made from samples of different Louis Vuitton bags. A total of 15 bags were used, which were actually taken from the LV spring/summer and cruise lines. The shoulder strap is made up of a gold chain. Only two dozen of these bags were made and despite the fact that critics have disparaged the design of this tote, and people felt the handbag looked like it may have been chewed up by a lawnmower or it is perfect for a discerning 90s rapper, all the bags have sold out quickly. This bag is certainly Louis Vuitton’s most expensive as of now, but not the world’s most expensive, as that record is currently held by Hermes Birkin at $64,800. However, the next Louis Vuitton release is going to change that, and at $150,000, the ‘Urban Satchel” coming out in Spring 2008 is said to be the world’s most expensive handbag. This bag which exhibits a unique taste of fashion, is unbelievably crafted with all sorts of weird stuff like a band aid, shrimp tails, tea bags, gums, cigarette packets and a used water bottle. Described as Fugly, it is considered by critics to be one of the ugliest bags and is aimed at the rich and famous teenagers. According to sources, the Olsen Twins, Anna Wintour and Victoria Beckham are among the celebrities that are involved in the bidding war to own these bags. There is another of Louis Vuitton bags worth mentioning, and it is the most expensive golf bag in the world, ‘the Damier Gaente Golf Bag.” This bag is named after the canvas that has been used for making it. It may not go well with the animal activists, but a good bit of cowhide is used for making the base of the bag, in the piping as well as in parts of the removable shoulder strap. The bag has a number of pockets, a zip-up hood, a rolling travel cover as well as an umbrella for use if there is unexpected rain. The price is a huge $8,400, which seems almost affordable in comparison to their other two expensive bags from LV. This bag is expected to be a huge hit with all those classy golfers wearing expensive golf wear and using expensive golf clubs, and most of all, by those people that look to impress others with everything they do. In spite of being called the Frankenstein’s monster and every other name possible by critics, there are many celebrities who would give an arm to own these designer bags that cost the amount of a college education for the commoner. These bags look good on people who know their value and in the celebrity circles. That is what brand value is all about – wear it only if you can carry it off or else it would look like a fake picked up from the local yard sale. Ten Best Health Facilities In the United States! that bag is interesting i think……….. I really like luis vuitton bag but they are very expensive..it’s like you are paying for the brand. I don’t know if it has quality. This bag looks like crap, like something a child would design. Not nice at all. WHAT IF I GOT A BAG OF FECES AND P[UT A PRICE TAG OF 80K ON IT WOULD PEOPLE BUY IT? I honestly love Louis Vuitton’s work. I own 2 but this is disgusting.